This is the twenty-fourth post in the Around the World Birthday Extravaganza Series and the first post in Japan! Please scroll to the bottom to see all the other posts in this series. It’s been my wish forever to hike and enjoy fall foliage on my birthday. Hiking is one of my favorite activities, and I always try to do something I love on my birthday. Unfortunately, my birthday falls in November, which means (at least here in Boston), it’s really cold outside, the sun sets super early, and the leaves have long fallen off the trees. So I never get to go hiking. This past year, for the first time, we were not in Boston on my birthday. Instead, as part of this crazy Around the World Birthday Extravaganza, we were traveling through Italy, France, Japan, and Hong Kong. In Tokyo, fall foliage peaks in November. Finally, for the first time in my life, I would be able to hike for my birthday, as well as be in one of my favorite countries in the world. I chose Mount Takao, a fun, popular hiking spot that is located about 50 minutes from Tokyo via train (390 yen). Once you get off the train stop (Takaosan guchi), it’s a super short walk to the entrance of the park. There are 8 trails that go up. The most popular is trail number 1, the only one that is completely paved. If you don’t want to climb, you can also take a funicular train that stops at various stations on the way up. Some people do a mixture, like choosing to take the tram up and then climbing down. Despite the fact that the trail is completely paved, it is quite a strenuous climb! The road is very steep at certain points and there are long stairways. You will most certainly get winded! On the way up, you’ll see tons of gorgeous views of Tokyo in the distance. It’s not just a hiking site, though. 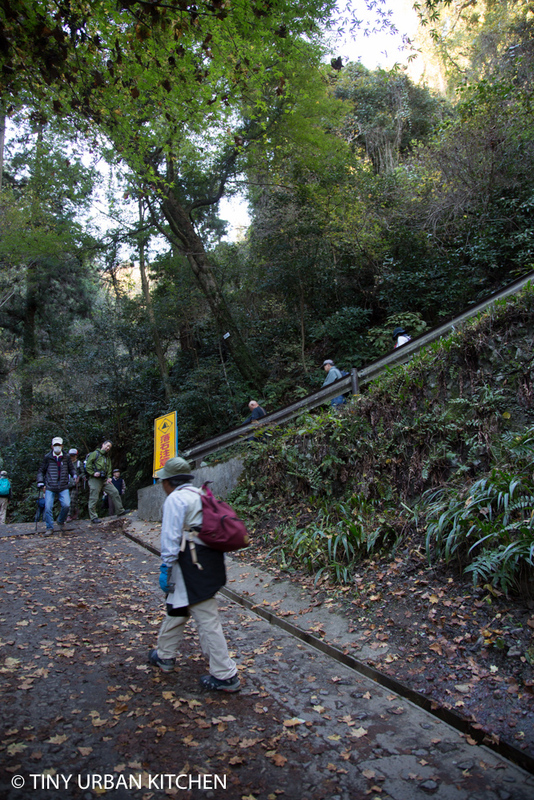 Mount Takao has been considered a sacred mountain for over 1000 years. Yakuoin is a huge Shinto-Buddhist temple at the top, and many people visit to pay their respects to the mountain gods. You can see statues, temples, and many other religious objects. Near the top, vendors sell all sorts of fun “street” snacks. The whole hike is just beautiful. The best part is that on a clear day, you can get a really good view of Mt. Fuji. When we went at the end of November, fall foliage was just starting but had not yet peaked. It was still beautiful though, and I enjoyed it immensely. You can do the roundtrip hike in about 2- 3 hours, but I would give more time if you want the flexibility to wander around the shops, visit the temples, and taste some of the food from the various vendors. You could even have lunch up there at one of the restaurants. I really enjoyed the hike. I loved how hiking Mt. Takao encompassed a nice mix of nature (views of Mt. Fuji and lots of foliage), city (amazing views of Tokyo! ), culture (temples and statues), and food (street snacks!). Getting a really good workout was a bonus!